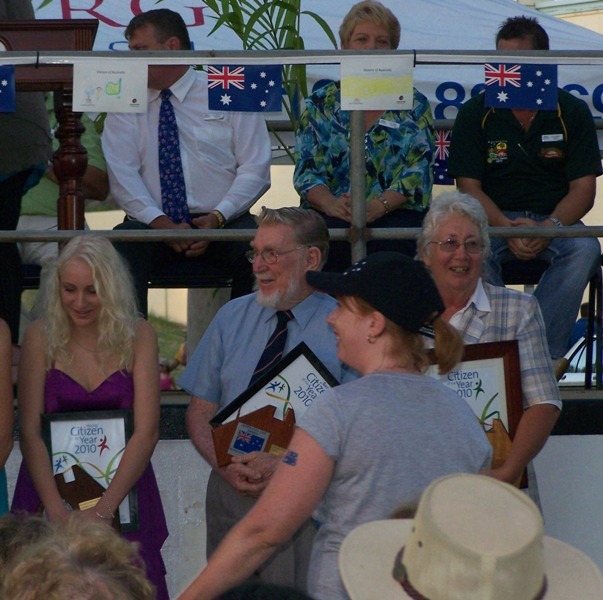 At the 2010 Bundaberg Regional Council's Australia Day celebrations the Mayor, Lorraine Pyefinch, presented John "Rusty" McGrath with the Bundaberg Senior Citizen of the Year award. In presenting the major Awards of the ceremony the Mayor made mention of the personal sacrifice and years of voluntary service by the award recipients. For those of us in the Bundaberg club we only need to read some club history to know that when Rusty [ VK4JM ] was elected President in 2008 & again in 2009 it wasn't a matter of who can we get to do this job? It was a welcome home for Rusty who had also been Club President 45 years ago. Now nearing his 80th birthday (a thing to be celebrated in the true Irish tradition we're told ) Rusty must surely be one of the most active presidents in amateur radio today and he leads the Bundy club by fine example. It was Rusty and a few others who formed this club in September 1961, and served as President in 1964 & 65. He was Secretary continuously from 1975 to 2008. 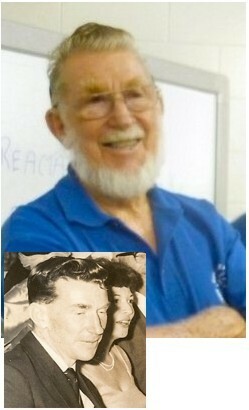 His only break were the years 1965-75 when he worked tirelessly for local Scouts when his children were involved. But what does Rusty do as Club President ? Training leader with Bundaberg Amateur Radio club – training anyone interested in Amateur Radio as a hobby. Assessor for the Wireless Institute of Australia (WIA) leading a local team conducting Examinations and assessments at all levels of Amateur Radio. Host to Gin Gin scouts/cubs at his radio shack every October, as part of the Scouts JOTA activities. Good Samaritan by leading a small group of hams who erect and/or repair antennas for older members who can no longer manage – he is often seen on someone’s roof wearing a climbing harness with antenna in hand. He, together with VK4JJ, are the cunning Mr And Mrs Fox in the club's monthly Radio Tracking Fox Hunts. And why does he do all this ? In training the team of 12 Club members as WICEN operators he is relentless in his pursuit of excellence, insisting that operators know how to erect emergency antennas and send or receive radio traffic in the correct format. The aim is to be a viable unit working behind the scenes for Welfare Services and the SES in times of natural disaster. The high standards assure WICEN's place within the Bundaberg Disaster management plan. As the Club's training officer he teaches anyone who wants to learn, from 15 year old kids to men and women who are retired and take up the hobby late in life as a way to keep their minds active. In the role of WIA Learning Organiser, his team have assessed 29 candidates in the region in the last 4 years ensuring a new generation of Radio Amateurs. Rusty continually teaches new hams the time honoured methods of antenna and equipment construction by way of regular club workshops. Amateur Radio is stronger and assured of a prosperous future because of the time and effort he gives. He and Joscelyn support many radio club activities Australia-wide and bring back what they’ve learned at conventions and meetings to our members. He never stops learning and sharing that knowledge with the club. In his previous working life Rusty was an Electrician, employed for many years at the Bundaberg City council, ending his career there in the capacity of Work Health & Safety Officer and Training Officer. Prior to that he was in the Merchant Navy and an Electrical apprentice before that. He married his beloved Joscelyn [ VK4JJ ] when she was a trainee nurse at the Bundaberg Hospital and together they have raised a family of 3 sons and 2 daughters from their home in Elliott Heads. They aren't the traditional elderly couple relaxing in their living rooms, rather they've continued to backpack around many parts of the world since Rusty’s retirement. Their fondest memories of such trips come from their practice of staying at Youth Hostels and roaming at will. As a proud Irish descendant their last trip in 2008 was to Ireland & England for 3 months as they did the "Walking Trails". Staying in hostels and college campuses they enjoyed the company of those less than a quarter of their age. And how do others feel ? He said it was thanks to Rusty, who 45 years ago saw this kid with a ‘bent’ for making things. It was Rusty who taught him to solder, arranged his first apprenticeship and helped him with his amateur radio licence and inspired a Bundaberg boy to excel. There is no doubt that George was genius material but it was Rusty who knew; who saw; and inspired. 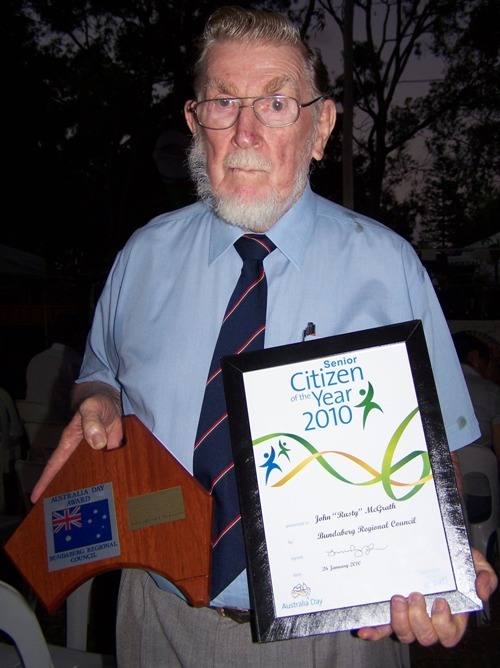 Receiving this Australia Day Award goes part way to recognising a man who gives to others. He asks nothing from those who seek his tuition, his guidance or his services. He inspires those at training sessions to want to excel. And although the work he undertakes with WICEN may never be needed, he makes sure it’s there; it’s reliable and can be counted on... Just like Rusty himself.